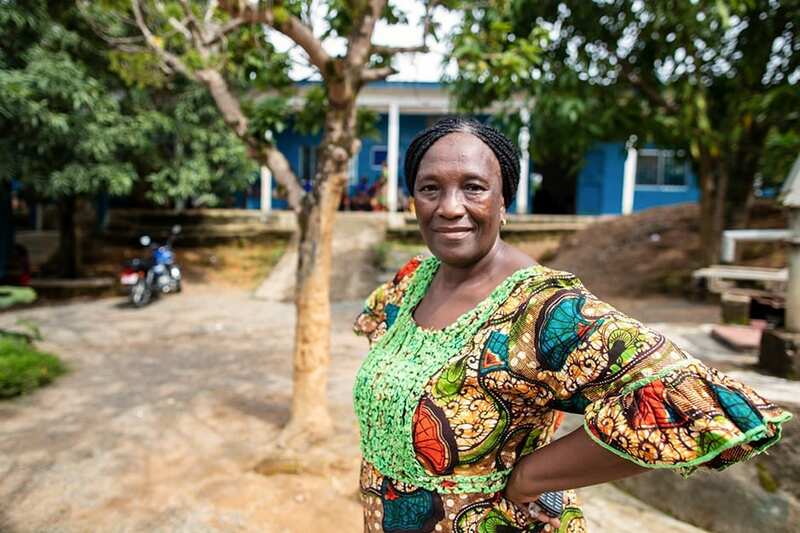 Boyama Gladys Katingor stands outside Wellbody Clinic in Kono, Sierra Leone, where she has served as the head midwife since 2014. (Photo by Jon Lascher / Partners In Health). Walking around her clinic in the muggy heat, Gladys, 52, attracts a lot of attention. During the morning’s whirlwind of activity, people rush up to her from every direction: uniformed midwives, women with newborn babies strapped to their backs, heavily pregnant women. She speaks to everyone in a gentle, encouraging tone and goes out of her way to offer advice wherever possible. This is how Gladys starts most of her days as head midwife at Wellbody Clinic in Kono, Sierra Leone. “I’m always on my feet, educating my staff, and saying, ‘Let’s not let any danger occur to our patients,’” says Gladys. Known as Gladys to friends and colleagues, Boyama Gladys Katingor joined Wellbody, a Partners In Health-supported clinic, in 2014, and has since been trail-blazing female empowerment. At the clinic, Gladys strives to standardize a modern approach to women’s health care. And in doing so, she tackles a number of universally debated and politically charged issues—including teenage pregnancy, abortion, and female genital mutilation—by listening, loving, and, when necessary, lecturing. Gladys grew up in Longie village, roughly 30 miles from Koidu, Kono District’s capital. She is one of the few girls from her village cohort to complete her education. Following high school, Gladys trained as a community nurse for the nonprofit organization, International Rescue Committee. Her role with IRC involved coaching new mothers on how to administer basic medicines, such as anti-malarials and tuberculosis medication, to their families. After gaining significant experience there, Gladys made the decision to resume her studies and train as a midwife, leading to her current role with PIH. 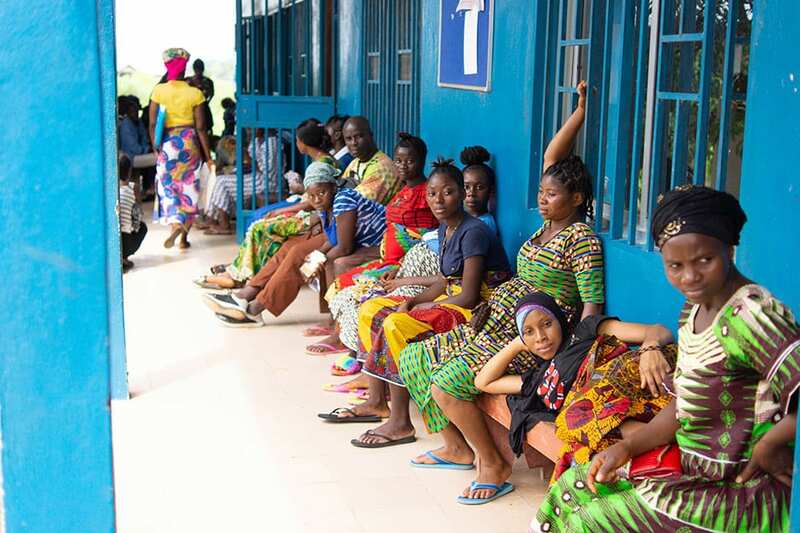 Sierra Leone had the seventh highest rate of teenage pregnancy in the world, with 38 percent of women delivering their first baby before the age of 18. At Wellbody, expectant mothers under the age of 18 are invited to stay at a birth waiting home for the month preceding their labor. Here, they receive free prenatal care and meals, and enjoy a supportive environment. Postnatal classes are also available at Wellbody following a birth, and Gladys makes sure new mothers are supported in a number of ways, including through family planning services. Abortion is another tough reality Gladys confronts. They are illegal, but not uncommon, in Sierra Leone. “They’re performed on girls in villages who come to Wellbody Clinic afterwards in very bad health,” she says. Many even face death. One-fifth of global maternal deaths result from unsafe abortions, and Sierra Leone is no exception. Gladys quickly refers them to the local hospital. Perhaps the most challenging, and familiar, situation Gladys deals with is female genital mutilation, or FGM, a procedure commonly carried-out on adolescents. In Africa, around 3 million girls undergo FGM each year; Sierra Leone is one of the only countries where the rate is over 90 percent. FGM often takes place in a small hut, in an area known as “the bush,” on the outskirts of a village. Multiple girls will stay in the hut at any one time, while the procedure is performed on each of them. What should a girl do if she’s encouraged to go through FGM? “If a girl confides in me at Wellbody, I will tell her of the hazards and advise her against having it done,” Gladys says. Donate today to help support PIH staff like Gladys continue to provide compassionate and high quality care to women and girls around the world. Read more about how PIH is supporting women's health in all the countries where we work.